Only 8% of us succeed in our New Years Resolutions and a staggering quarter of us make and fail at the SAME resolution each year! So what can we do to give ourselves the best chance of success? 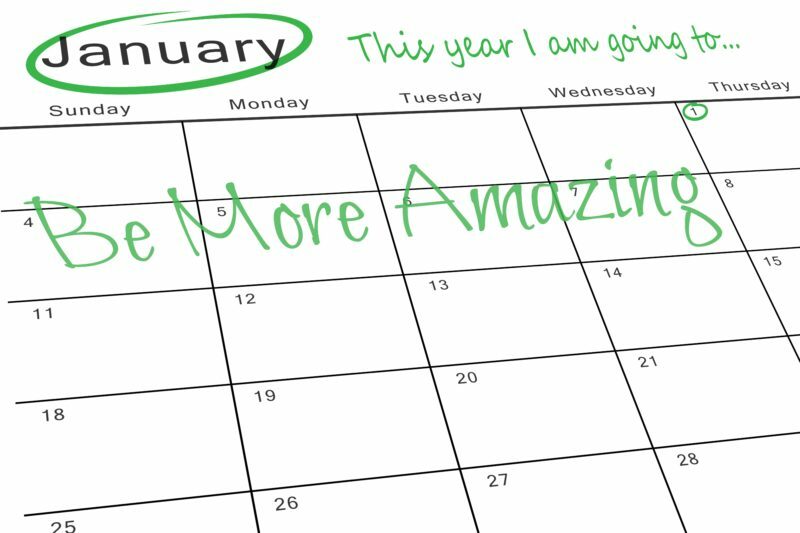 Here at Inspired to Change we understand how our brains work and why we often go wrong with our resolutions. We’ve pulled together our top tips to help keep you on track! Setting a goal that is unachievable causes stress and overwhelm in the brain making it very unlikely that we will even start working towards it in the first place let alone achieve it! The trick is to set yourself a goal that takes you a few steps outside your comfort zone – enough that it challenges you but not so much that it overwhelms you. Break your goals down into small chunks. This means that each time you achieve a small chunk of the journey towards your goal you get a hit of your feel good hormone serotonin which gives you a sense of achievement and motivates you to take further action. If you keep your goals big you have to wait a lot longer to get your hit of motivation! At this time of year many people’s focus is on being fitter and healthier but understanding why this is important is key to your motivation. It’s not enough to say I want to lose 1 stone, you need to understand why that is important to you. It might be because you are getting married and want to look amazing on your wedding day, or it might be that it will reduce health risks like high blood pressure. But why is that important to you? It might be because you want to be able to support your family or because you have a holiday of a life time coming up that requires you to be fit and healthy. Whatever your goal is keep asking yourself “why” until you get to the real nub of the issue because that is what will keep you motivated. Making a small change that can be repeated often throughout the day is more likely to stick and become a lasting behaviour. So if you want to do 100 sit ups a day set yourself a goal of doing 10 sit ups every time you boil the kettle! Our brain learns through repetition so the more we repeat something the quicker it will get set as a habit in our brain. And we know how powerful habits can be! Our willpower is directly related to how much energy our brain has available to it. To keep up a steady flow of energy, and therefore willpower, start the day with a good quality protein breakfast and then top up on healthy high protein snacks like nuts or seeds throughout the day. This way you won’t run out of willpower just when you need it the most! Along with eating the right foods rest is essential to restore our brain energy and our willpower. So make sure you get plenty of shut eye to keep you on track. If you’re struggling to sleep at night it might be time to speak to your local Inspired to Change hypnotherapist. Our brain doesn’t really like the word “don’t”. If I tell you “don’t think of a blue elephant” I can be pretty sure you are now thinking about a blue elephant! A subtle shift in focus makes a real difference when you’re trying to form new habits – rather than saying “I don’t want to eat biscuits” and shifting all your brain’s focus to the plate of biscuits, try saying to yourself “I only eat the healthy options” and see what happens. Every time you celebrate an achievement your brain releases the feel good hormone serotonin helping to motivate you further towards your goals. It’s a wonderful, natural, internal reward system that will help to keep you on track! All the research shows us that the guilt we feel when we don’t stick to our resolutions actually makes us more likely to quit. By being kinder to yourself you are much more likely to go back to working towards your goals rather than feeling you are a hopeless cause who will never be able to do it. So next time you don’t quite achieve what you wanted to do have a nicer chat with yourself, for example “I know I didn’t go to the gym as many times as I wanted to this week but that’s ok, I had to stay at work late for that emergency and I know I’ll be back on it next week”. Nobody wants to let others down so find yourself a buddy who will either join you in your resolution or who will check in with you each week to hear about your progress. This isn’t a buddy who will pat you on the back and say “never mind” if you don’t achieve your goal, this buddy needs to be prepared to ask what you will do differently next week if you didn’t stick to it this week. So make sure you give them permission to push you a little bit outside your comfort zone! If you’d like to find out how hypnotherapy could help you achieve your goals in 2017 get in touch with your local Inspired to Change hypnotherapist and book your FREE initial consultation. Inspired to Change Hypnotherapists are based across the UK in Bristol, Cambridgeshire, Devon, Kent, Leicestershire, Northamptonshire, Norfolk and Somerset.